In spite of social media and almost instant news from anywhere in the world, our children have a very limited idea of world geography. When we talk about places in the Bible, most kids either think it was in the next town or possibly on another planet. The younger the children are, the harder it is for them to understand where things happened. In order to understand the Bible is true and contains historical stories of real people, places and events, your students need to begin to understand where some of these places were and are. Enter the map quilt. 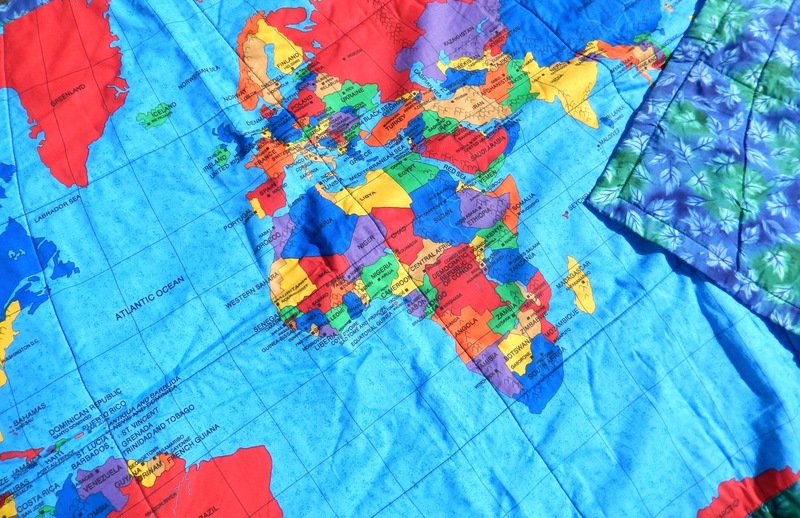 I did a little googling and found an expensive piece of fabric that is actually a world map. My mother quilts, but a decent seamstress (not me!) could easily replicate what she did. She took a thin piece of batting and placed it between the map fabric and the coordinated fabric backing (which was a few inches larger than the map). She used the longitudinal and latitudinal lines to sew along (tacking the three pieces together) and then made a pretty quilt edge around the entire map. If you don’t sew or know anyone who does, you could probably just zigzag around the edges of the map fabric and carry it around as is. If I am talking about any types of places during my lesson, I always begin by pulling out my map quilt. We find where we are on the map and then where the story takes place. If place names have changed (Ex:Persia and Iran), I make sure my students understand the new place name as well as the old one. As much as we like to think kids today hate geography, I have found most children love working with my map quilt. So grab your computer or head to your fabric store and buy some map fabric. You will soon find it is one of your favorite resources.